In life, feeling down or miserable sometimes is normal. But if these feelings become painful, we may experience an aching heart, mind, body and spirit. We could have trouble sleeping or a change in appetite. We might withdraw from families and friends, and lose hope. This could be depression, especially if it lasts longer than a couple of weeks. Depression is very common. It can affect relationships with family and friends and our ability to work or go to school. It can also lead to suicide. 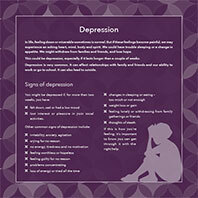 This factsheet contains information about the signs of depression, possible causes of depression, how to get help, and tips on getting well and keeping well. Read more from Denise Kingi-'Ulu'ave about understanding depression for Pasifika.